Japan is releasing Tertiary Industry Activity m/m, PPI y/y, and Core Machinery Orders m/m data along with the US publishing Federal Budget Balance, Natural Gas Storage, Core PPI m/m and Unemployment Claims. 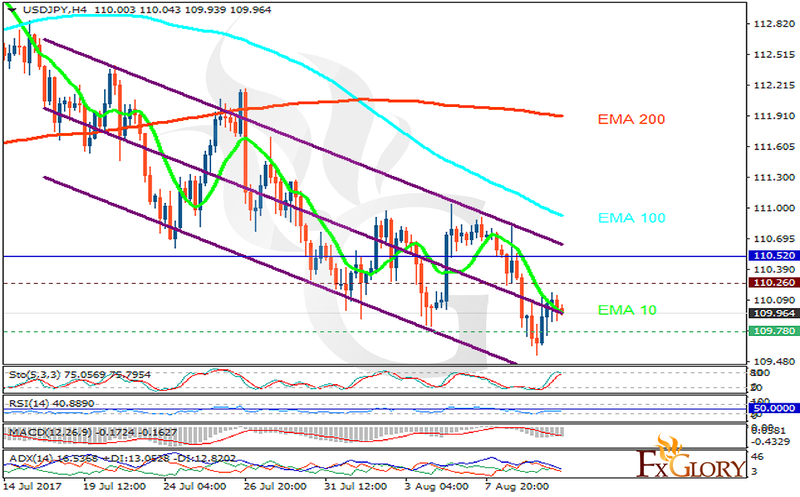 The support rests at 109.780 with resistance at 110.260 which both lines are below the weekly pivot point at 110.520. The EMA of 10 is moving with bearish bias along the descendant channel and it is below the EMA of 100 and the EMA of 200. The RSI is falling towards the oversold area, the Stochastic is showing downward momentum and the MACD indicator is in negative territory. The ADX is not showing any clear signals. Sellers can target 109 level.